Katakana is a phonetic alphabet covering syllables and consists of 46 different characters. It is mainly used for foreign loanwords and sometimes to replace kanji or hiragana for emphasis. Katakana were developed in the ninth century and are also derived from more complex kanji. List of 21 katakana digraphs and their 15 diagritics. As with hiragana there also are combinations to express the other sounds required for the Japanese language. These 46 katakana and their variations are sufficient to express all sounds used for Japanese words. In order to get closer to the pronunciation of foreign words, a list of not so common extended katakana is used. 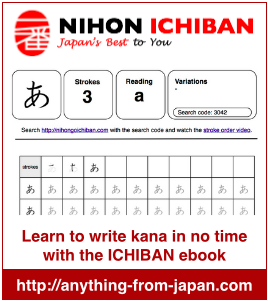 Download the NIHONGO ICHIBAN PRINT YOURSELF Hiragana & Katakana Workbook and practice writing hiragana on worksheets that you can print at home as often as you like. Could you help me? I want to download this Workbook but the link doesn’t work for me. Thanks! very interesting i wil check it /Ohh esta muy interesante todo!! voy a chekear mas! Sorry…I tried both the link on the site and the one above to download the Kana workbooks…and it says 404 not found?